I think 2013 is the year of the egg. Remember when you used to scramble them or fry them or boil them or serve them over easy? Have you looked on Pinterest lately? Someone is always painting or stamping or wrapping or stickering….an egg. I am nothing……if not the first one on the current trend bandwagon. So here’s my contribution to the egg decorating phenomenon. 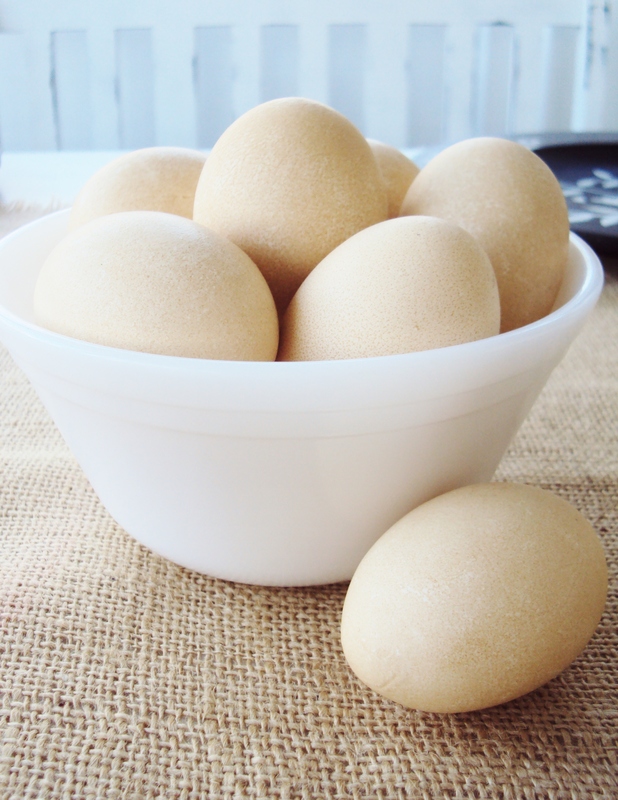 Start by hollowing out eggs like this. This is a fancy way of saying that I made a cup of hot tea, let it cool and then dipped the eggs in the tea. Actually, I had no idea what the eggs were going to look like with tea staining all over them, but I officially love this color. 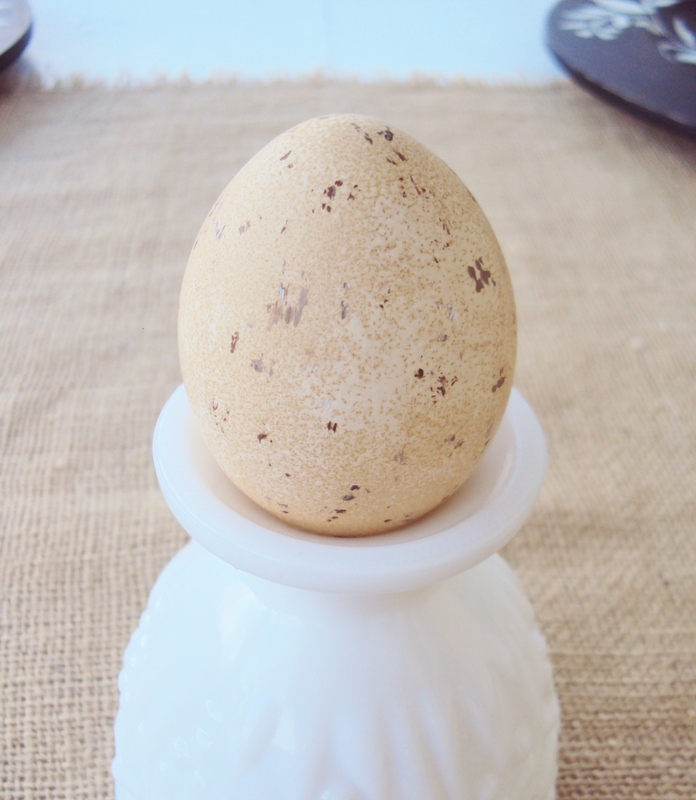 Next I dipped a toothbrush into craft paint and lightly tapped it onto the egg. (1) Start with just a few speckles. You can always add more later. 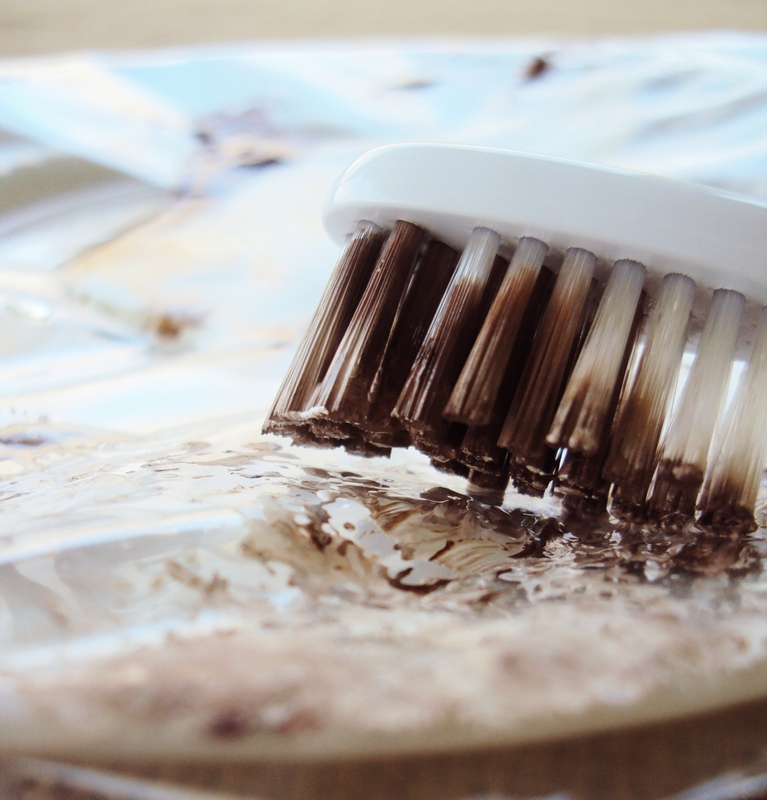 (2) Tap most of the paint off your toothbrush before you tap the egg. This allows just a little paint to transfer. Remember, the goal is speckles, not polka dots. When you are done, you end up with something that looks like this. And it only took 18.25 minutes from beginning to end. 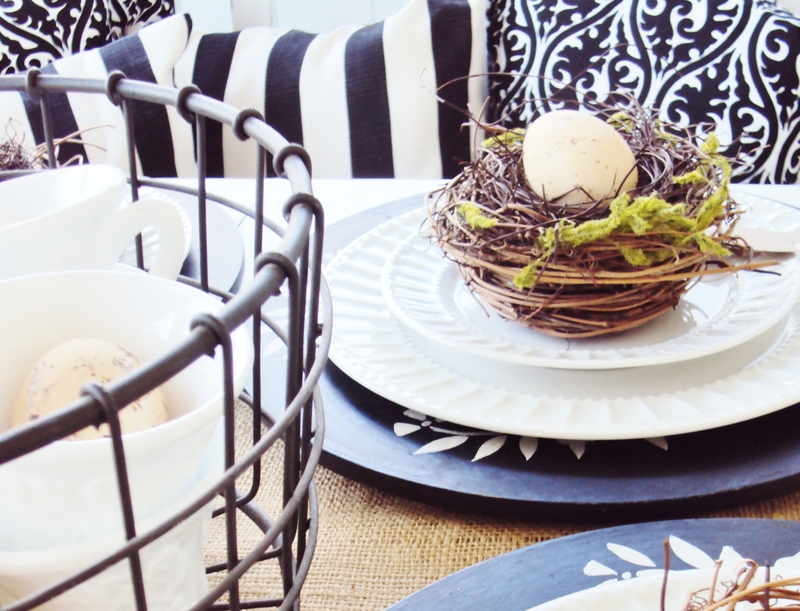 ….add a nest and burlap…. ….a stack of white dishes…. …..and a little tag that says “Happy Spring” and seriously…. ….you are one step away from your own network cable special. PS I so blessed to be part of a fun group of bloggers who celebrate everything eggs and flowers and bunnies and Spring. Wait until you see the amazing projects that have been shared so far! And Courtney from French Country Cottage, and Jennifer from Jennifer Rizzo are posting this weekend. On this Monday, March 18 we’ll all be hosting one HUGE It’s a Spring Thing! Linky Party! Stop by and link up your Easter and Spring posts!. I can’t wait to see them! Purple onion skins, and broccoli I am doing these next year, thanks for reminding me of beets! These are beautiful! The only seasonal decorating I really ever do is for Christmas, but this makes me want to do a little Easter/spring decorating soon! Adore!!!!!!! Such beautiful place settings Karianne!! Love your tute too - I will have to try that speckling-with-a-toothbrush-tip!!! Where did you get your darling little nests? I've been looking for some!! 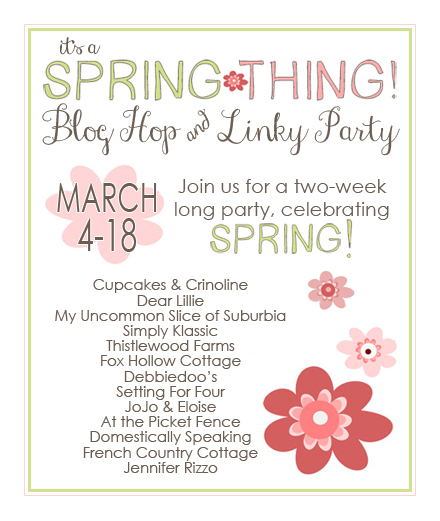 It's been such a pleasure and joy to 'party' with you in this fun "It's a Spring thing" blog hop!! Have a wonderful weekend! How cute is this! Hmmm . . . this would be a good craft to go along with making, say, a pound cake? Cheesecake? Something that takes LOTS of not-separated eggs? See what I did there? Crafty went right over to FOOD. That's why I have EIGHTEEN food-related Pinterest Boards, and FIVE craft-related ones . . . Happy Friday and happy SUNSHINY DAY!!!! I love those eggs. I wonder, if one were to spray a matte finish protective coat of some sort over the eggs if it would make them a little less fragile?? Most "craft" projects are way over my head, but this I could do. I have been making hollow eggs for years and yes a coat of something be it shellac or clear fingernail polish does make them 'harder' but they are still eggs and are delicate. Call Benjamin Moore! You have a new paint color for them---Farm Fresh Khaki! Seriously, those are adorable and the presentation is magazine worthy. Such a great idea. 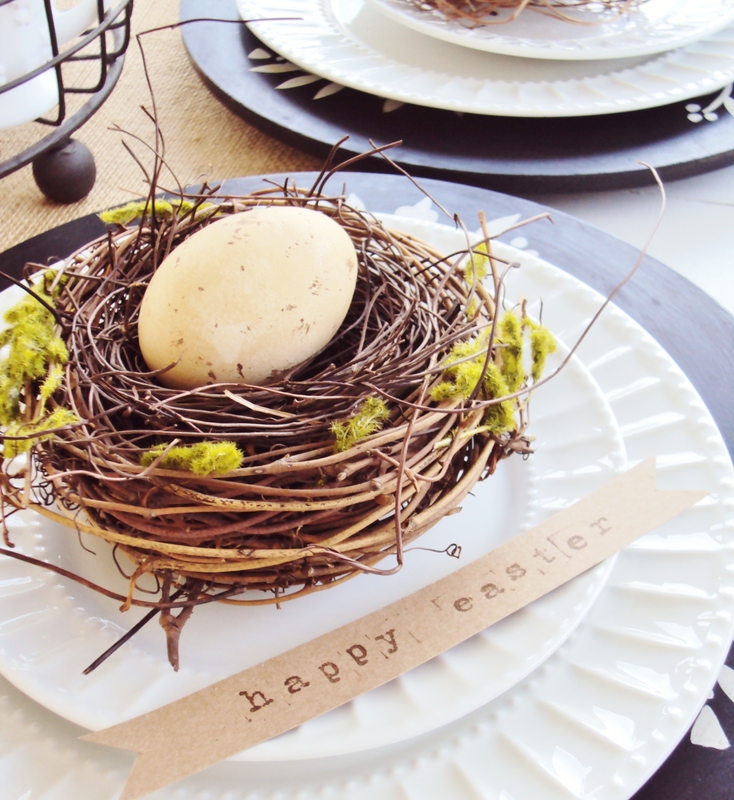 I love the simple Happy Easter slip at each place setting. Mind if I copy you? So cute KariAnne, have I mentioned how much I enjoy reading your blog? your writing style is a ray of sunshine and your talent is amazing. Congrats on making it to round two. I knew that project was yours as soon as I saw it. I love it. I wish I had a place for one in my house. Hmmm, have to work on that LOL. Love these eggs. I just wanted to let you know different types of tea will give you different colors to your eggs. Teas with berries will have a pinkish tint, Green teas will have a green tint and the stronger the tea the darker the color. I tried tea staining this year but didn't do the speckles, but I will next year! Thanks for sharing its too pretty. This is so clever! And I love the way the look as table decorations! I need a new centerpiece so I may need to give this a try! These are beautiful my crafty friend! Looking forward to cracking some eggs with your shortly ... :) me! So pretty Karianne! I love your new blog design too! And the best part is you can use your real egg goo and make an omelet or French Toast or scrambled eggs!!!! No waste!!!! This is a great tutorial, KA- you done good. It's so pretty. Have a fun and safe awesome St. pat's weekend. Karianne, these are so pretty! I love the color treatment with the nests! Looking good! Have a wonderful weekend! Kariann, try staining them in hot water bath with onion skins. They come out a gorgeous mahogany color. IF you then take a pin you can scratch a design into them. Found this years ago in a Williamsburg book. Lol Karianne! You crack me up!!! Love the eggs!!! And the whole tablescape, using old dishes! Have a great weekend! 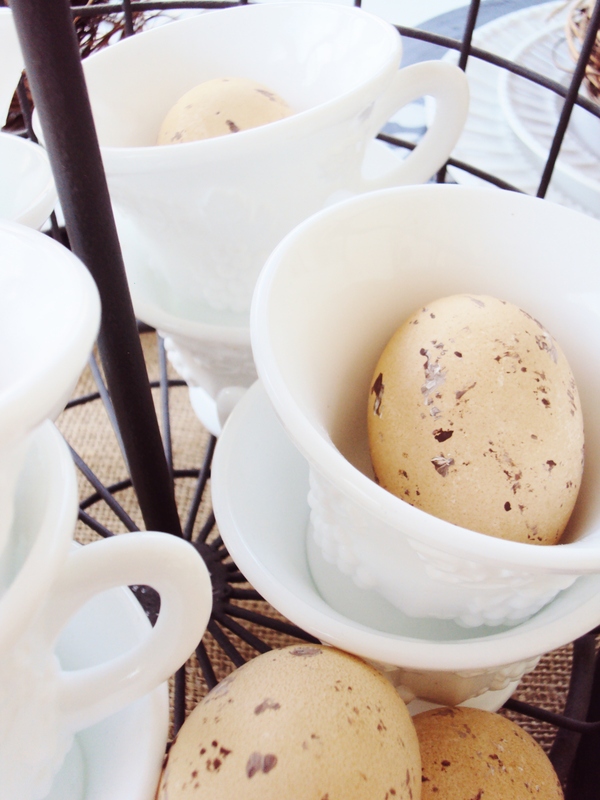 Love your tea stained eggs! I pinned and will definitely be trying this! Thanks! 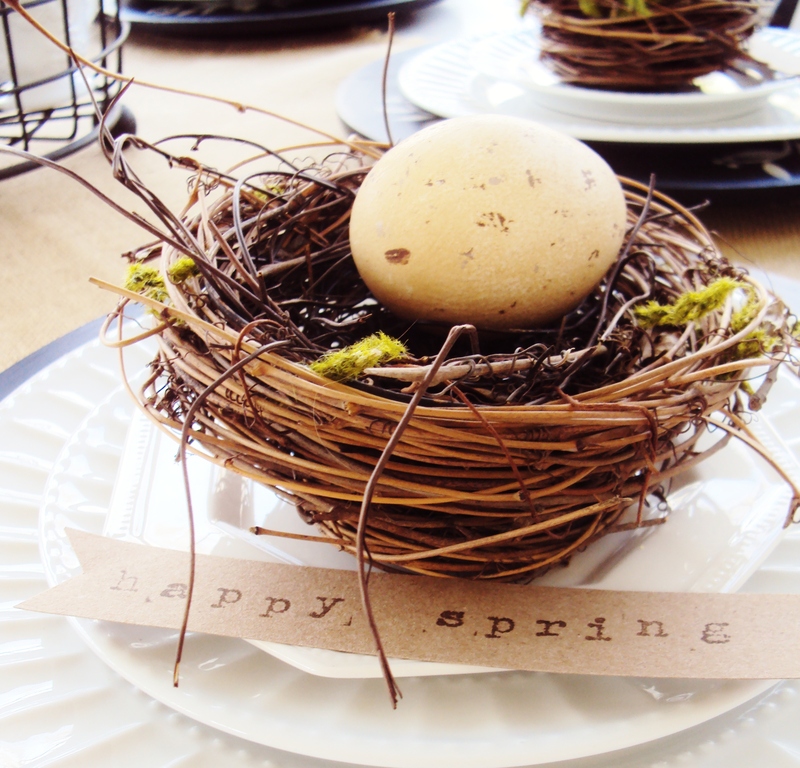 LOVE the eggs and love the perfect little touch of the "Happy Spring" tag! SO pretty and simple! I wil have to try this one! Have a lovely day! You have so many great ideas! I found you through Funky Junk's yardstick party and am a new follower!